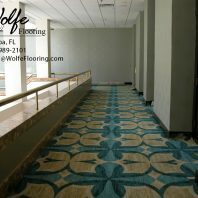 Commercial Sheet Vinyl | Wolfe Flooring Inc.
Commercial sheet vinyls divide into two types: homogeneous (HOM) sheet vinyl and heterogeneous (HET) sheet vinyl. The homogeneous sheet vinyls are widely used in antiseptic locations (e.g., hospital operating rooms). Heterogeneous sheet vinyls offer more visual options. Within commercial sheet vinyls, there is a type manufactured as slip-retardant flooring (SR or SRF) to reduce the chance of slips. Doors may have to be adjusted or cut at the bottom (i.e., planed) after your flooring is installed. Determinations as to whether such alterations are needed may not be possible prior to the installation. Door adjustments are priced separately. This is highly unlikely for sheet vinyl installations. If you have a concrete subfloor, the subfloor's pH level should be tested. (This test in not needed for wood subfloors.) As concrete cures, the hydrating moisture deposits alkali salt on the concrete's surface. The pH reading should be between 5 to 10 to be suitable for sheet vinyl. Alkali can deteriorate adhesives. Testing of the subfloor should be done early in order to deal with any problem that you may possibly detect. This test is usually just a matter of formality, except in the case of new construction or below-grade subfloors. Customers will need to verify that the relative humidity of the building is between 30% to 70%. High humidity may cause your new vinyl to expand and may also hinder the adhesive's curing time. Most customers have the proper relative humidity. 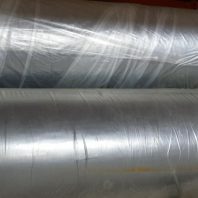 After the temperature has been properly set, acclimate the new sheet vinyl to the room 48 hours prior to the installation. The subfloor must be in suitable condition. Your subfloor may or may not require floor prep. The amount of preparation varies depending on: the type of subfloor, the subfloor's condition, the manufacturer's specifications, and the installation method you select. Subfloor preparation is priced separately. The stability and precision of the subfloor will have a bearing on the long-term success of your new flooring. Sheet vinyl requires a very smooth floor. Sheet vinyl will conform to minor irregularites and will eventually show by what is called telegraphing. Perimeter-glue installations require less floor prep than full-spread installations. BE ASSURED THAT FLOOR PREP IS USUALLY ONLY A NOMINAL EXPENSE. Documentation. Process the billing and get a hand written or published warranty. Retain the sales receipt and any product description from the purchase of the goods. If possible, document the manufacturer's name and the manufacturer's full product description including color. Furthermore, retain a sample of the vinyl for comparisons. For insurance purposes, it's good to have a picture of your new product in a safe place. Attic Stock. Retain extra vinyl for possible repairs that may be needed in the future. Keep the materials in a dry place that stays about room temperature. Do not put this in the attic. 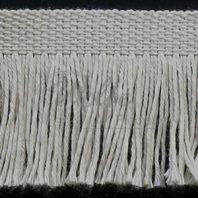 Extreme heat can damage the backing and cause discoloration. Do not allow the vinyl to be crushed while rolled up or folded. Roll the vinyl in an even roll or lay it flat. It is especially good if you can roll the remnant around a core for support. Wolfe Flooring picks up all flooring product scraps. The customer will need to sweep the vinyl. Seams should not be swept for 24 hours after the installation. Do not return the furniture or expose the sheet vinyl to heavy foot traffic for 24 hours after the installation. The adhesive needs time to cure. Do not step directly on seams for 24 hours after the vinyl installation. Maintain the same temperature for 48 hours after your installation. Never allow the subfloor's temperature to fall below 55° or exceed 90° F during the life of your sheet vinyl. If you have a radiant-heated floor system, please leave the floor set to 70° for 48 hours after the installation. Many sheet vinyls are either no-wax vinyls or waxing is optional. If your sheet vinyl requires a polish or wax, follow the instructions of the manufacturer. Do not wet clean the sheet vinyl for 3 days after the installation. Moisture will affect the adhesive and could lead to significant long-term problems.